Humpbacks are well known for "slapping" (hitting the water with their pectoral fins) as well as "breaching" (jumping out of the water). Biologists are not yet sure about the reasons for these behaviours - some reasons commonly mentioned are to remove parasites from the skin, or for communication with females, or to intimidate rivals... but it might be that they do it just for fun. 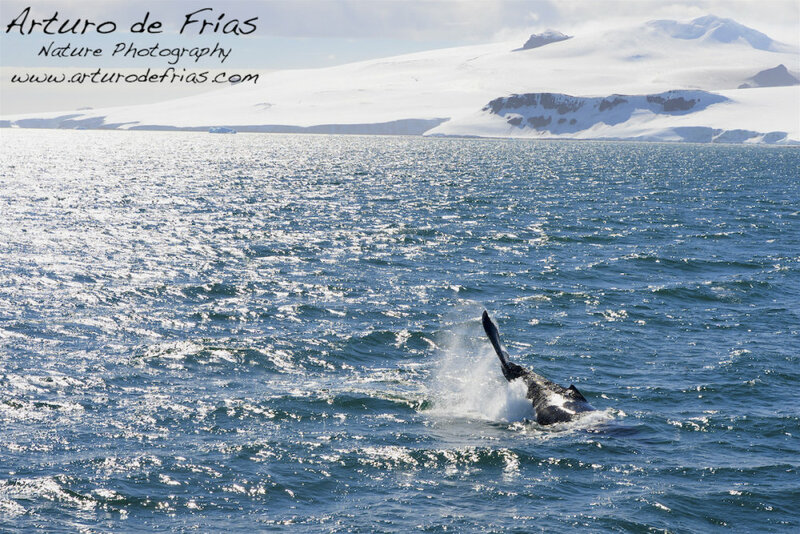 In any case, it is an amazing sight... an Antarctic landscape with a whale slapping is a true vision of wilderness. Uno de los comportamientos en superficie mas conocidos de las ballenas es el denominado 'slapping' cuando las ballenas golpean con fuerza la superficie del agua con sus aletas. Los científicos no están del todo seguros de la razón de este comportamiento. Las razones mas comúnmente mencionadas incluyen una forma de comunicación, librarse de parasitos en la piel, atraer la atención de posibles parejas, o simplemente, por diversión.